Don't write off the bull market in stocks just yet. 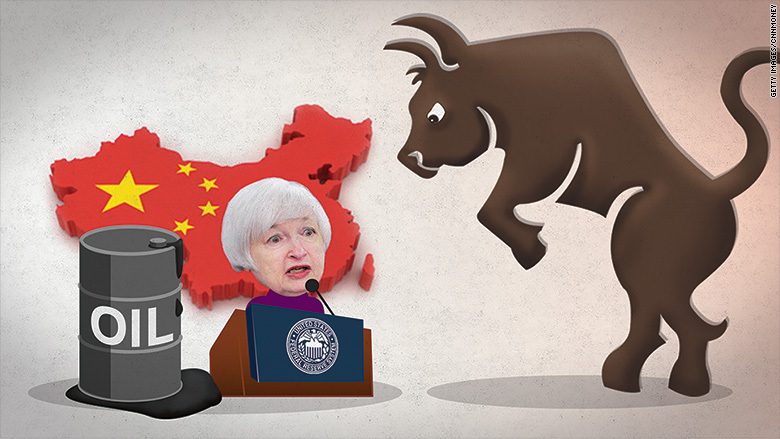 Yes, there's a flurry of threats that could bring about the bull's demise in 2016 -- U.S. stocks aren't cheap, China's economy continues to stumble and the Federal Reserve is removing the easy-money punchbowl that kept the good times rolling on Wall Street. But market professionals surveyed by CNNMoney believe that the U.S. stock market will claw its way past these obstacles and reach new heights next year. On average, survey respondents estimate the S&P 500 will end 2016 at 2,194 -- up 9% from Friday's close. That would represent a solid rebound from 2015's lackluster performance. The S&P 500 is down over 2% so far this year, putting it on track for its worst year since the 2008 financial crisis. "We think this cyclical bull market has more room to run and expect a good (but not great) return for the stock market in 2016," wrote Scott Wren, senior equity strategist at the Wells Fargo Investment Institute. Those who think stocks will rise next year argue the U.S. economy will continue to slowly recover from the Great Recession, thanks to a pick-up in spending by businesses and consumers alike. They believe that should lift corporate profits, the main driver of equity prices. "The good outweighs the bad," said Phil Blancato, CEO of Ladenburg Thalmann Asset Management." "Two straight months of great job growth, early signs of wage inflation and low energy prices create a resilient consumer that should keep the U.S. moving forward." That doesn't mean risks don't loom in the horizon. Investors remain on the lookout for potential "curve balls" that could derail the bull market, including a scary geopolitical event like a terrorist attack, a blowup in emerging markets or an uncomfortable acceleration of inflation. But by far, the biggest concern on investors' radar remains China. The once-booming economy's slowdown helped fuel the big market freakout in the summer that knocked the S&P 500 into "correction" territory. The fear is that China's economic slowdown will worsen, dragging the rest of the world into recession. Just last week a private research group warned China's economy is in "dangerous" territory on a number of fronts. John Praveen, chief investment strategist at Prudential International Investments, said he's concerned about "missteps" in China's efforts to reform its economy that result in a "hard landing and market turmoil." Others are more worried about how the stock market reacts as the Fed slowly raises interest rates next year. At a minimum, the Fed's moves are likely to create greater turbulence -- something that was on full display in the stock markets late last week. Concerns about Fed policy and plunging oil prices have already created trouble in the junk bond market. Those issues were highlighted by the recent implosion of Third Avenue mutual fund that invested in distressed debt. "We will have some credit accidents, but on balance not a credit meltdown," said Jack Rivkin, CEO of investment firm Altegris. Even if worries in the junk bond market dissipate, it's getting harder and harder to argue U.S. stocks look cheap after recent declines in corporate profits. Stocks look much less expensive in Europe and Japan. "(U.S.) valuations are clearly elevated," said Terry Sandven, chief equity strategist at U.S. Bank Wealth Management. Despite these worries, there are pockets of the stock market that do look attractive to observers. That's why most market pros aren't advising clients to move assets to cash. In fact, many are telling investors to be ready to buy on the dips. And with the expected volatility, there may be quite a few of those next year. Many expect the Nasdaq, which is up 4% this year, to continue to outperform thanks to strength of tech stocks such as Netflix (NFLX) and Amazon (AMZN), both of which rose over 100% this year. Investors are particularly bullish on tech stocks with exposure to emerging technology like cloud computing and cybersecurity. Consumer discretionary stocks were also among this year's top performers as Americans started spending more at restaurants and buying big ticket household items, helping the stocks of Olive Garden-parent Darden Restaurants (DRI) and Home Depot (HD) rise over 20% this year. Thanks to strong jobs growth and expectations that gas prices will stay relatively cheap, experts expect these companies to be showered with more love next year. After years of being shunned, bank stocks are getting lots of attention lately. Banks are one of the few sectors that actually benefit from rising rates, which allow them to make more money off loans. The financial sector "is poised for a breakout in 2016," said Blancato.